This drama, which is commonly called "Unagidani" or "Otsuma Hachirobê", is based on a real incident, which occured in Ôsaka in the 7th lunar month of 1702 in the district of Unagidani. It was almost immediately adapted for Kabuki and staged in Ôsaka three major theaters. The thema was revived in the 7th lunar month of 1731 with the drama "Fumizuki Urami no Kiriko", which was produced by Iwai Hanshirô III at the Naka no Shibai. Another event, the murder of a courtesan named Wakano in Ôsaka in 1764, led to a new production using the same title "Fumizuki Urami no Kiriko", which was staged in the 8th lunar month of 1764 at the Naka no Shibai, starring Nakamura Kumetarô I, Mimasu Daigorô I and Arashi Shichigorô II in the roles of Otsuma, Hachirobê and Yahei. The puppet theater got its own version, written by Yatami Heishichi, which was entitled "Tsuma Gasane Naniwa no Hachimonji" and staged for the first time in the 2nd lunar month of 1769 at the Takemotoza. Another version of the story of Otsuma and Hachirobê for the puppets, entitled "Sakuratsuba Urami no Samezaya", was staged in the 11th lunar month of 1774 at the Toyotakeza. The most popular scene of this drama, commonly called "Unagidani", was later on adapted for Kabuki. It was successfully revived by Kataoka Gatô III in May 1894 at the Minamiza. The star decided to add it to his collection of favourite roles (Kataoka Jûnishû). Hachirobê, an ex-samurai dealer in second-hand articles (furuteya), is in need of money to achieve the recovery of a treasured sword stolen from his former master's house. To help him acquire the necessary sum of money his wife Otsuma, after consultation with her mother but without Hachirobê's knowledge, decides to divorce him and marry Yahei, a rich curio dealer (dôguya), who has promised to give her 50 ryô. In Hachirobê's absence Yahei comes to his house with the go-between Jûbê. When Hachirobê returns with a cake for his little daughter Ohan, Otsuma and her mother tell him that Otsuma is going to marry Yahei. Hachirobê tries to attack Otsuma but is interrupted by Yahei who, claiming that Otsuma is his wife, threatens to kill him if he assaults her. As Hachirobê goes out of the house without further ado Yahei thrusts Ohan out into the street and asks Otsuma to go to bed with him. 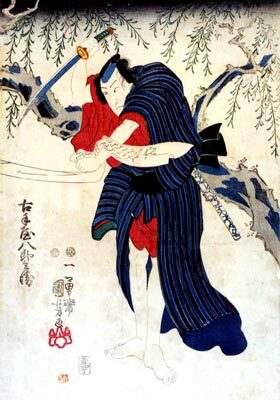 Hachirobê soon comes back and, furious at finding Ohan left out in the cold, bursts into the house and slashes both Otsuma and her mother to death. Yahei barely escapes with his life. Hachirobê tries to commit suicide but is dissuaded by Ohan and Gimpachi, a friend of Hachirobê's who has come to see him. 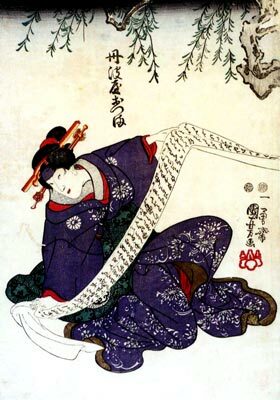 Ohan then recites a verbal will of the illiterate Otsuma, which she has trained Ohan to memorize. Hachirobê now learns, all too late, of Otsuma's faithfulness to him and her pretended marriage for the sake of getting money for him. Hachirobê also learns through Yahei's letter left behind by him that Yahei has stolen the sword Hachirobê has been seeking.